NOBLESVILLE – For the fourth consecutive year, NorthWood will compete against the best of what Indiana has to offer. The Lady Panthers golf team will join the field for the 2019 Hall of Fame Invitational on Saturday, Sept. 7, at Purgatory Golf Club in Noblesville. This is the sixth time in program history NorthWood has competed in the prestigious tournament, featuring some of the top clubs in Indiana high school girls golf. Eleven of the top 12 finishing teams at the IHSAA State Finals are among the field, to which NorthWood finished tenth as a team. State champion Evansville North, runner-up Zionsville and No. 8 Culver Academy are among the field. Northridge is the only other area team invited to the showcase, which will have 21 teams square off starting at 1 p.m. at the famed golf course. 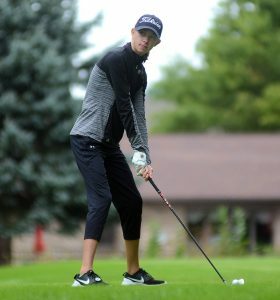 NorthWood should return a very solid lineup, featuring to-be sophomore Cybil Stillson, who tied for 13th at the state finals with a plus-11 for the tournament, just six shots back of the state runner-up. Expected to return with state experience include seniors Delaney Davis, Kirsten Schrock and Makenna Gall as well as sophomore Breanna Goss.